On Monday afternoon, local attorney Peter Martin and Eureka City Attorney Cyndy Day-Wilson got together for lunch. 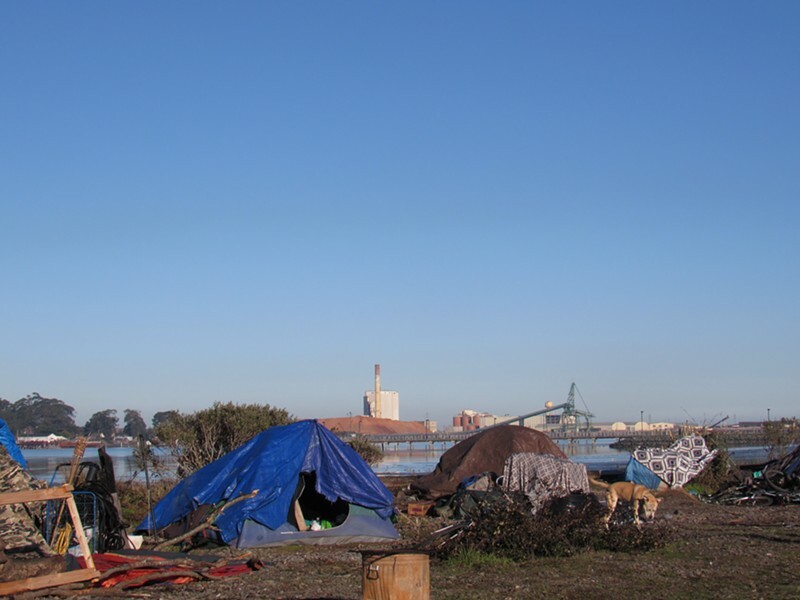 The topic of the day was a lawsuit Martin was working on and looking to bring against the city stemming from its ordering about 150 homeless people in the Palco Marsh to vacate the area by May 2. Day-Wilson had reached out to Martin in the hopes of dissuading him from filing the lawsuit and, according to Martin, during lunch she explained to him that the city simply didn’t have any money to help relocate the soon-to-be-displaced marsh residents. “I’m always a little bit suspicious of government officials who tell me they don’t have any money, because it seems they have money for the things they deem important,” Martin said. By the end of the day, Martin had filed a lawsuit in federal court on behalf of 11 plaintiffs, alleging the city was violating their constitutional rights and the protections of the federal Uniform Relocation Assistance Act. On the surface, the main tenet of Martin’s argument is a pretty simple one: By pushing people out of the marsh and enforcing its anti-camping ordinance when there isn’t enough shelter space to accommodate them, the city is illegally criminalizing homelessness and violating people’s rights. More specifically, Martin is arguing that the city’s actions will constitute cruel and unusual punishment under the Eighth Amendment of the U.S. Constitution and violate homeless people’s right to privacy and constitutional protections against unwarranted search and seizure. Additionally, Martin is arguing that because federal funds are being used for the first phase of the city’s waterfront trail project — which includes the tearing down of the old lumber kilns known as the Devil’s Playground and some trail building in the marsh area — the homeless people currently residing there should be entitled to funds to help them relocate. The plaintiffs represented by Martin range in age from 23 to 57, with some having been born and raised in Humboldt County and others being relatively recent transplants, according to the suit. They report having lived in the PalCo Marsh from six months to 10 years. 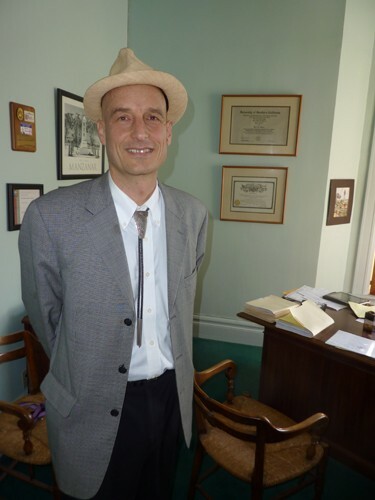 In his suit, Martin is seeking a temporary restraining order preventing Eureka from following through with its planned May 2 eviction and from enforcing the anti-camping provisions of its municipal code on anyone residing in the marsh. Further, Martin is seeking a reimbursement of attorneys fees and costs in bringing the suit, as well as any other relief the court “deems just and proper.” In a phone interview, Martin said potential damages in the case under the Uniform Relocation Assistance Act could include up to 42 months of housing expenses for his plaintiffs. It’s worth noting that the Uniform Relocation Assistance Act only applies to federal projects, and Eureka Mayor Frank Jager told the Journal no federal funds are being spent on the trail project. Martin, however, alleges in the suit that the funds used for the trail project have traveled a convoluted path, having been re-purposed and re-allocated several times. But, Martin contends (beginning on page 66 of the suit, which is in PDF form below) that some of the project funds originated from the “Eureka Non-Freeway Alternative project” and are, in fact, federal. 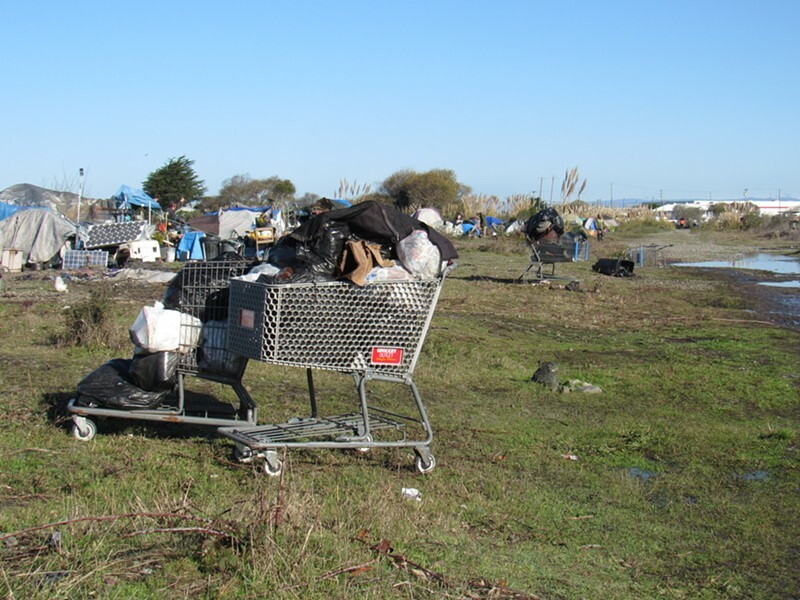 An abandoned shopping cart in the PalCo Marsh. Jager added that, with the deplorable environmental conditions associated with the PalCo Marsh encampments, he hoped attorneys like Martin, entities like the California Coastal Commission and environmental groups like Humboldt Baykeeper would have helped find solutions, but that has not been the case. For his part, Jager said Martin’s plaintiffs — and the other 100 or so people down in the marsh — are trespassing on city property, “impacting sensitive wildlife,” creating a health hazard and have been recalcitrant in the face of helping hands. Jager’s contention that there are plenty of places for folks currently living in the marsh to go if they choose seems likely to cut to the heart of Martin’s lawsuit. Martin contends that if all the people living in the marsh immediately sought the shelter beds provided, there wouldn’t be enough to go around. Further, he contends that some shelters’ requirements that people staying there have a photo identification and be sober, coupled with some shelters’ religious programs, effectively shut out segments of the local homeless population. Jager said the suit is just “a shame,” and lamented the fact that “this issue” has eaten up staff time over the past year to the detriment of other city functions. The mayor said he’d like to see the entire community — and especially those, like Martin, advocating on behalf of the homeless — do more.